Some people get excited about watching the Super Bowl. Me? The Golden Globes. The red carpet gowns, celebrity couples, speeches…A TV viewing event this monumental deserves a snack that’s just as grand. To me, the ideal awards-show-watching food pairs well with a glass of low-sugar bubbly and can be eaten with your hands. 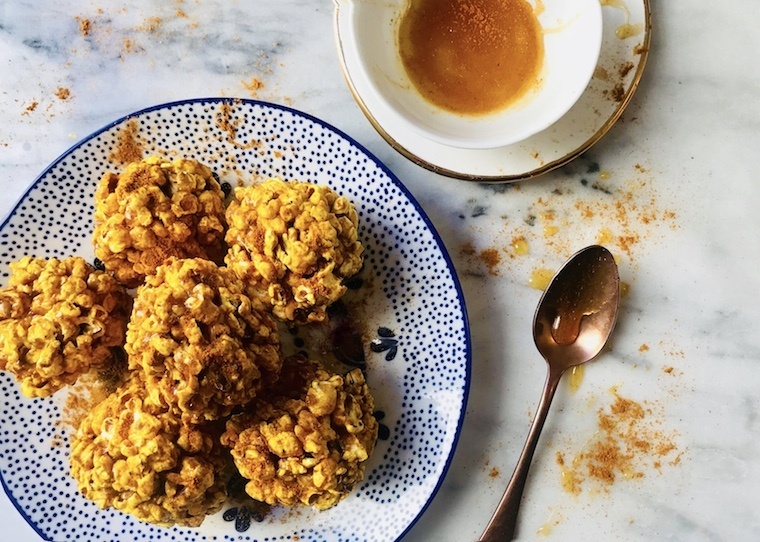 So whether you’re watching the glitz and glamour curled up on the couch in your PJ’s (as I will be) or hosting friends for a viewing party, this recipe for turmeric honey popcorn balls hits all the taste notes: sweet, salty, and spicy. Popcorn balls are traditionally made with corn syrup or marshmallows, AKA highly processed forms of sugar. I make mine with raw honey, which is anti-bacterial and contains amino acids and antioxidants. Turmeric powder gives the popcorn balls their “golden” glow and contains an anti-inflammatory compound called curcumin. One tip I learned from GoldynGlow founder, Saara Vakil: Add black pepper to recipes containing turmeric to increase its bioavailability, which basically means your body’s ability to absorb and benefit from the micronutrient. This is roughly how it works: Black pepper contains a natural alkaloid compound called piperine that allows the curcumin to pass through the gut membrane and not get excreted through the liver as quickly, so your body can maximize the spice’s benefits by about 1,000 percent. You an also enhance the bioavailability of turmeric by consuming it with some sort of healthy fat, like the coconut oil and grass-fed butter in this recipe. That’s because it’s fat-soluble, which means it doesn’t fully get absorbed unless it is bound to a fat. Besides the good-for-you ingredients, this snack—not-so-coincidentally—looks a little bit like the trophies being handed out, so you could say they make everyone who gets one, one of the night’s big winners. Want to try this snack for yourself? Keep reading to get the recipe. I used turmeric and black pepper for this recipe but you can also use a hot or mild curry powder and pepper if you prefer that flavoring. To get extra fancy, you could also add a half cup toasted chopped nuts or half cup large unsweetened coconut flakes. 1. In a large pot with a lid, heat coconut oil over medium heat. Add the kernels and place the lid on top of the pot. Cook until most of the kernels pop, shaking the pot gently every minute. When the popping sounds slow down, remove the pot from the heat and uncover. Set aside. 2. In a medium sized saucepan over low heat, add the butter and cook until the butter is melted. Add the honey and remove from heat. Add salt, pepper, and turmeric or curry powder and mix to combine. 3. Drizzle half of the honey butter mixture over popcorn and using a spoon or hands, mix to combine. Add half of the rest of the mixture and mix again. Taste the popcorn and adjust seasoning, adding more salt or spice if desired. (If using, you would add the toasted nuts or coconut and mix to combine now.) Reserve the rest of the mixture to drizzle on balls later, if desired. 4. Using wet hands, compress a large handful of popcorn to form a ball roughly the size of a baseball. (If you are having difficulty getting popcorn to stick together, add more of the honey mixture and try again.) Place the ball on a baking sheet or serving tray. Rewet hands and repeat the process until all the popcorn is used. Allow balls to come to room temperature before serving. If you’re looking for more ideas of what to nosh on while you watch the Golden Globes, try these healthy takes on your favorite snacks. Or jazz up your air-popped kernels with these genius popcorn recipes.